^ S. Beleza et al., "The Timing of Pigmentation Lightening in Europeans", Molecular Biology and Evolution, Vol. 30, Iss. 1, 1 January 2013, pp. 24–35, doi:10.1093/molbev/mss207. see also: E.R. 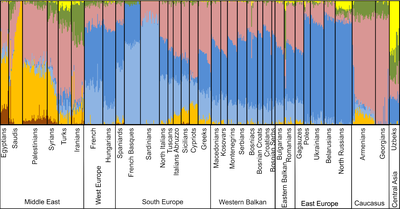 Jones, "Upper Palaeolithic genomes reveal deep roots of modern Eurasians", Nature Communications volume 6, Article number: 8912 (2015), https://www.nature.com/articles/ncomms9912 doi:10.1038/ncomms9912]. In human genetics, Haplogroup J-M172 or J2 is a Y-chromosome haplogroup which is a subclade (branch) of haplogroup J-M304. Haplogroup J-M172 is common in modern populations in Western Asia, Central Asia, South Asia, Europe and North Africa. It is thought that J-M172 may have originated between the Caucasus Mountains, Mesopotamia and the Levant. Haplogroup L-M20 is a human Y-DNA haplogroup, which is defined by SNPs M11, M20, M61 and M185. As a secondary descendant of haplogroup K and a primary branch of haplogroup LT, haplogroup L currently has the alternative phylogenetic name of K1a, and is a sibling of haplogroup T.
In genetic genealogy and human genetics, Y DNA haplogroup J-M267, also commonly known as haplogroup J1, is a subclade (branch) of Y-DNA haplogroup J-P209 along with its sibling clade Y DNA haplogroup J-M172. African admixture in Europe refers to the presence of admixture events attributable to dispersal of populations inhabiting Africa in the genetic history of Europe. Certain Y-DNA and mtDNA lineages are thought to have spread from Africa to the Near East during the later Pleistocene, and from there to Europe with the Neolithic Revolution. More recent, direct African admixture – primarily Berber admixture from North Africa – is associated with the Carthaginian period as well as Muslim conquests of the early medieval period, and is primarily concentrated in western and southern Iberian peninsula. North African admixture has also been detected in the Italian island of Sicily.